Grand Turk is known for the underwater habitat surrounding the island. Visitors can explore it by snorkeling, scuba, and snuba. 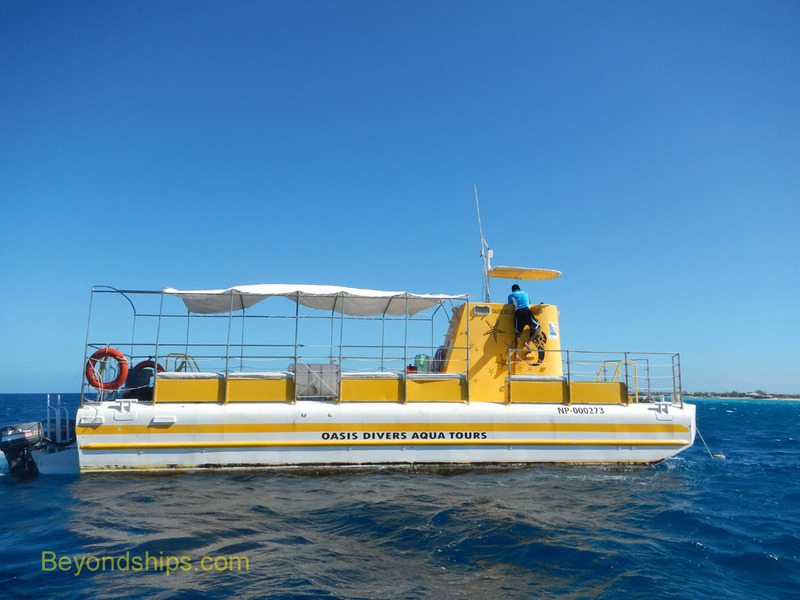 But for those who want a less active approach or just to stay dry, a tour in a semi-submarine is also a way to explore the depths. Like most shore excursions in Grand Turk, this tour assembled in the main plaza of the cruise center. 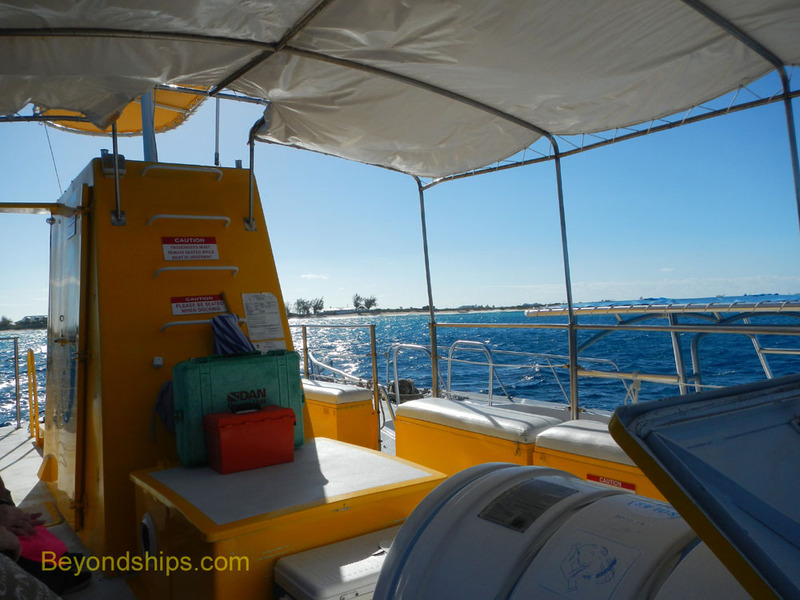 Once everyone had checked in, we walked a short distance to a pier that acts as the point of departure for many of the waterborne excursions offered in Grand Turk. The semi-sub was not at the pier. Instead, we boarded a launch powered by two large outboard motors that would take us to the semi-sub. It passed by our cruise ship and then took off up the coast of Grand Turk towards the capital Cockburn Town. Along the way, we passed catamarans and other craft as well as the beached wreck of a ship that had been washed ashore during a hurricane. The semi-sub was moored out in the open sea in Grand Turk's national park. This area is a nature preserve where fishing is prohibited. Long and narrow, this craft had a structure toward the bow that resembled a conning tower thus giving the semi-sub something of the shape of a submarine. Given that it looked something like a submarine, its bright yellow paint job was clearly appropriate. Indeed, it said on the side "Oasis Yellow Submarine." We transferred from the launch onto the bobbing semi-sub. We sat for a moment on the benches on the open deck while the captain explained the safety aspects of this craft. Then, we went through a hatch and down a steep ladder into the hull. Although these craft are sometimes referred to as a “sem-submarine” or as a “semi-submersible,” they do not actually submerge or dive beneath the water. The craft remains on the surface all of the time. The way the participants get to see what is happening beneath the waves is by going down into the craft's hull. Large picture windows placed below the waterline allow you to look out at what is happening under the water. This particular craft had windows along each side and in the front. A bench ran down the middle of the hull. Half of the guests sat on the bench facing the starboard windows while the other half sat facing the port side windows. Those in the front could also see out the front windows. Once everyone was seated, one of the crew members explained that the hatch would be closed during the tour. Presumably, this was done so that the cool air-conditioned air in the hull did not escape. It also cut down on the sunlight entering the hull, thus making it easier to see out the windows. The crew member went on to say that if anyone began to feel claustrophobic or felt they needed air, the hatch would be opened and they could go up onto the open deck above. Because the craft remains on the surface, it is subject to the motion of the ocean and indeed, this craft bounced and moved about. Whether from claustrophobia or from seasickness, two of the participants did request to go up to the open deck during the course of the tour. The state of the sea can also affect visibility. A passing storm can churn up the bottom and sediment can remain in suspension in the water for some time after the storm has passed. This reduces how far you can see underwater. On this occasion, the water was somewhat cloudy but you could still see the bottom and various fish swimming at a distance from the craft. As the craft slowly moved off, one of the crew members pointed out different types of coral and different species of fish that swam by. At one point, a sea turtle appeared. Someone spotted a barracuda. 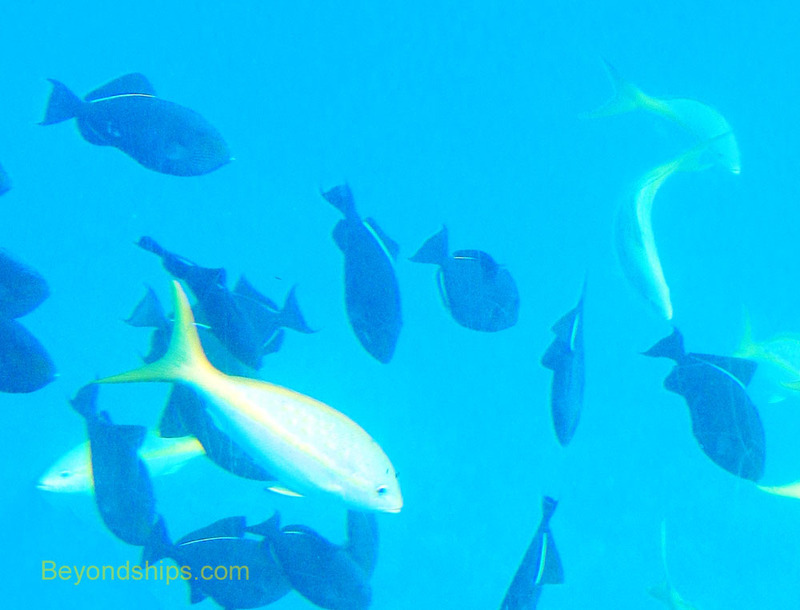 A school of yellow fin snapper swam along beside the craft. 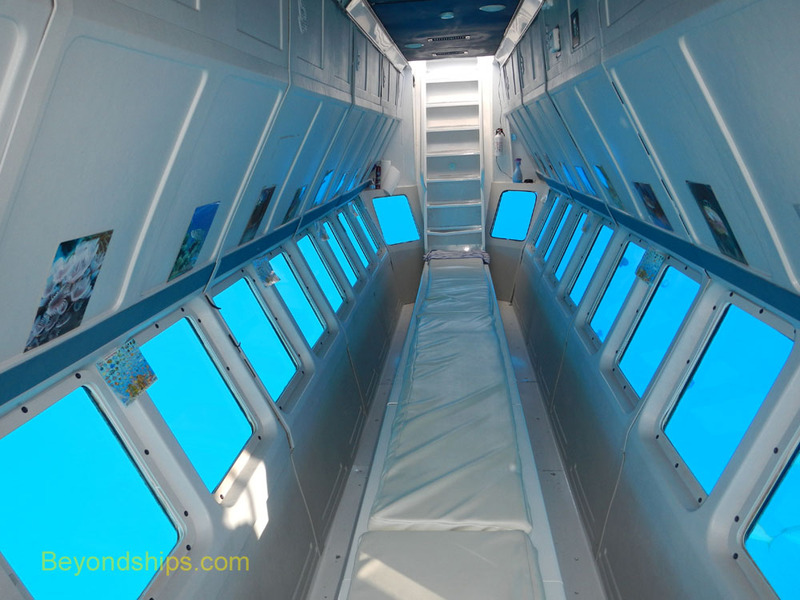 Above: The interior viewing area of the semi-submarine. Below: Fish swimming along side the semi-submarine kept a respectful distance. 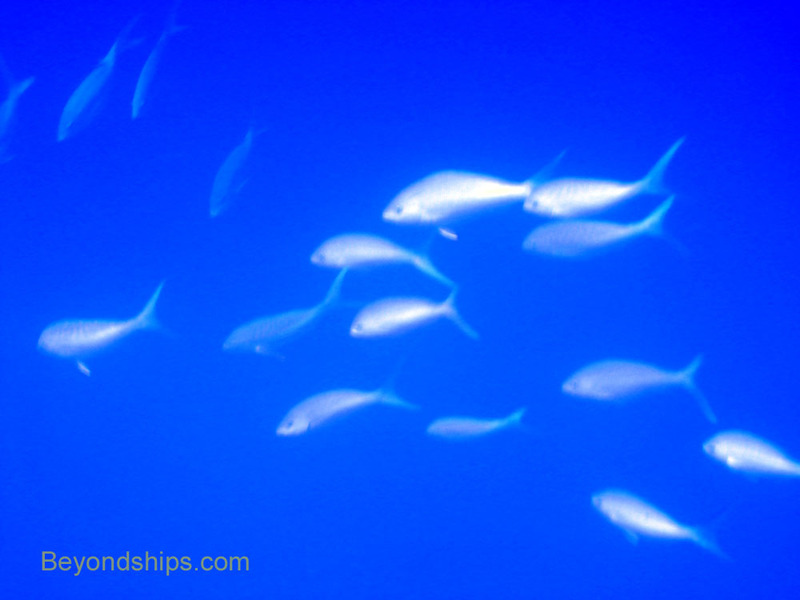 When the captain entered the water with food, the fish swarmed close to the semi-submarine. For the most part, the underwater scene looked like a desert landscape. Rocks and coral heads punctuated an otherwise sandy floor. Then suddenly the scene outside became completely dark blue. The crewman explained that we had gone over the Grand Turk Wall where the bottom drops off almost vertically to 7,000 feet. Our craft circled over the wall several times, going between the darkness of the abyss to the sunlit coral formations closer to shore. A parrot fish and some puffer fish fed along the visible bottom. Towards the end of the tour, the crew member announced that the captain was now going to go over the side and feed the fish. A moment later, a scuba diver appeared outside close to the windows. Hordes of fish quickly surrounded him in a feeding frenzy. During the tour, the fish had appeared quite small. However, now that they were close to the windows, we could see that these were sizable fish. Their proximity afforded good photo opportunities as well as an exciting experience. Once the food had run out, the fish disappeared. The captain came back aboard while the crew members helped the participants climb the ladder back to the open deck. They then continued to assist as the participants crossed from the semi-submersible back onto the launch that had brought us. The journey back was a high speed run parallel to the coast. It was a smooth ride but spray and the occasional wave splashed some of the particpants sitting in the front of the launch. However, the participants were happy with the tour and regarded the ride back in the tropical sunshine as exhilarating.